Saying THANK YOU isn't enough... To our retired, dynamic musical conductors Mr. Noel T. Kunkle and Mrs. Susie Downs Kunkle ...Thank you for your service of being wonderful directors to our Williamsport, MD Community Band since its beginning. You have touched the lives of pri0r students and community musicians since the start of the Williamsport, MD Community Band. We thank you for your many hours of behind the scenes dedication of many hours of work. Well done and thank you from the band. It was an end of a era tonight. The Williamsport, MD Community Band played its last summer concert this evening. We arrived and it was raining. There were a few faithful spectators, under umbrellas, ready to hear the concert. Should we have the concert? Should we cancel it? No, the show must go on. This was more than the last summer concert. It was the last concert that my parents would be "in charge" of. Mom has stepped away for a while now, but Dad stayed on through the summer concerts. It didn't hit me until after the concert started. I still can't put into words my feelings and emotions. Flashes of concerts, flashes of field shows. Flashes of students coming to the house for music lessons. Memories flooded my thoughts. The light rain continued. The umbrellas stayed up and everyone was fine. ​Mr. Deal, our devoted announcer, towards the end of the concert, gave homage to our fearless band director since its beginning almost 20 years ago. That is my Mom, Mrs. Susie Downs Kunkle. When Mr. Deal spoke so eloquently of both Mom and Dad, a glimmer of sun broke through the clouds. 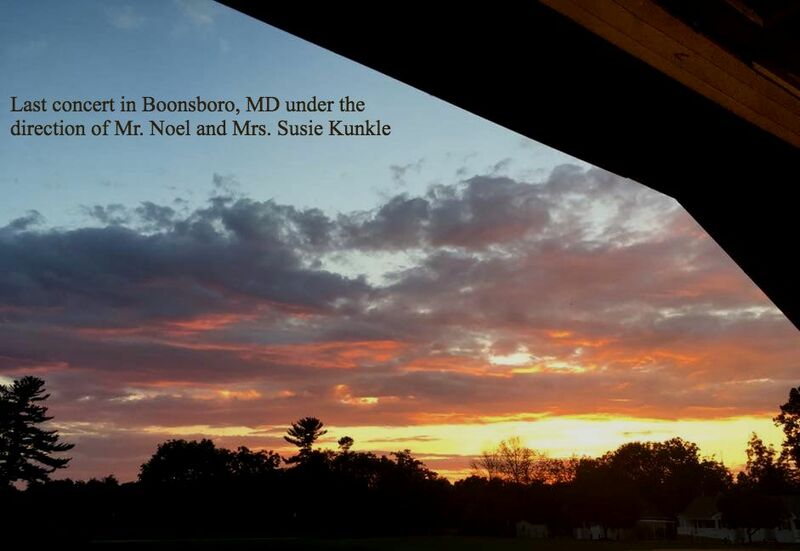 The rain cleared away and God painted a beautiful sunset in Boonsboro, MD. I played through tears most of the evening. It was a difficult task for me. My Dad directed his last song, America the Beautiful. We had one tune left to play. The Stars and Stripes Forever was next. Dad invited our son Kevin to the podium. He handed the baton to his oldest grandson to direct Stars and Stripes forever. Kevin did such a great job that it filled me with such Pride. ​I was sad that the normal of my parents directing the band was now over. I was proud that both Mom and Dad taught music and passed their love of music onto numerous students in the Washington County MD area. It was a hard concert for me to get through. Through the light rain, to the clouds parting with bright sun gave me an indication that there are always tomorrows and they can be bright. It's an end of an era. Yes, it is true, but the music will not end or die. It will just be continued in a different way. Well done Mom and Dad, well done. These are my words and reflections on what ended up being a beautiful evening.